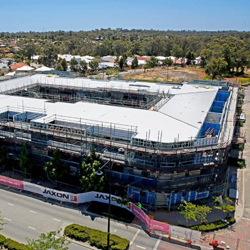 KWIK Logistics is one of Perth’s leading providers of mobile crane hire. We have a large fleet of modern cranes, suitable for a range of projects. With decades of industry experience, we can help advise you on the best crane for your project. We offer pick and carry cranes, as well as slewing cranes, that are well maintained and meet all safety standards. We also offer a range of specialised vehicles, including hiab hire, to help you complete your job with the best equipment available. 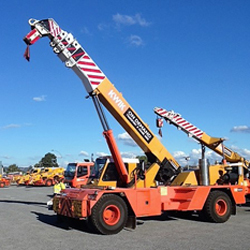 KWIK Logistics has one of the largest fleets of modern wet hire cranes available in Perth. We pride ourselves on providing exceptional customer service with equipment to match. We carry Franna, Tidd, and Manitowoc cranes – leading names in the industry with a reputation for quality machinery. Our cranes are regularly serviced and maintained in top condition year round. We aim to be a one-stop shop where you can get advice and equipment from experienced professionals. In addition to stand-alone cranes and hiabs, we also offer wet hire, inclusive of certified crane operators and accompanying equipment. No matter the size of your job, from residential projects to large commercial sites, KWIK Logistics offers comprehensive fleet services to meet your needs. KWIK Logistics offers a wide range of cranes and hiab hire to suit all industries. We offer pick and carry cranes, slewing cranes, and hiab trucks in a range of load capacity. Our experts can help advise you on the best crane for your project, taking into consideration your job site, access available, and load to be lifted. Our dedicated team offer exceptional service, and work with you to ensure your project is completed with the best equipment for the job. We take safety seriously at KWIK Logistics. 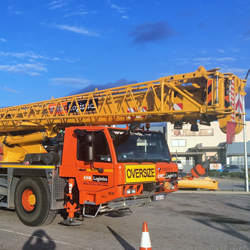 Our fleet of cranes are some of the most modern available, featuring the latest in on-board safety equipment. All cranes come with a complete array of lifting equipment as standard, providing you with everything you need to complete the job. All equipment is annually tested and independently certified. Whether your project requires a pick and carry crane, a slewing crane, or hiab hire, we value your protection above all else. Whether you are seeking mobile crane hire or are in need of specialised traffic control management, KWIK Logistics offers comprehensive services to suit your needs. We service a variety of industries, including mining, utilities, shipping and transport, defence, and engineering. We are a family owned and operated business that has been servicing the Perth area for decades. We offer one of the largest fleets of modern cranes for hire in Western Australia. Our experts have the skill to advise on a variety of projects, from small residential to large commercial jobs. We offer crane hire, crane operators, and traffic management services by skilled licensed professionals. Contact KWIK Logistics today for a free quote or site inspection, and let us help you complete your next project.